The Spotted Hyena is the largest of the hyena family and is usually the type of hyena that is portrayed in cartoons and movies. Its scientific name is Crocuta crocuta. It is also often called the laughing hyena. Where did they get the name Spotted? They get their name from the spots on their fur which is reddish brown in color with black spots. Spotted Hyenas have powerful forequarters with a strong neck and jaws. They have one of the strongest bites in the animal kingdom. Females are generally bigger than males and can weigh anywhere from 100 to 150 pounds. Spotted Hyenas live in much of central and southern Africa, south of the Sahara Desert. They can survive in a variety of habitats but like to live where there are lots of zebras and antelopes. This includes grasslands, savannas, woodlands, and sometimes even the mountains. What does the Spotted Hyena eat? Spotted hyenas are carnivores. They eat other animals of all types. They either hunt on their own or scavenge from the kills of other larger animals like lions. They are particularly good scavengers because they can crush bones with their powerful jaws and are able to eat and digest them. When they hunt they typically hunt wildebeests, gazelles, and zebras. However, they also will hunt snakes, young hippos and elephants, and even fish. Hyenas often hunt in a group, isolating and chasing down a weak or old animal from a herd of prey. Hyenas eat very fast as the fastest hyena gets the most food. 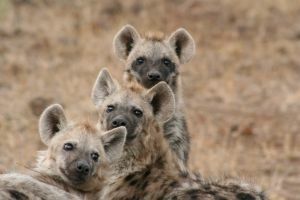 The Spotted Hyena is social and generally lives in groups called clans. Clans can vary in size from 5 to 90 hyenas and are led by a dominant female hyena called the matriarch. Spotted Hyenas make a lot of noises and sounds. One of them sounds a bit like laughing which is where they get their nickname. They have great night vision allowing them to see in the dark. They are considered to be very intelligent. Hyenas don't need to drink a lot of water and can go days without water if needed. Although they look like dogs, they are actually more like cats. 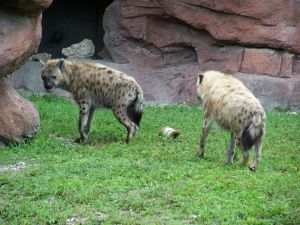 The other two species of hyenas are the brown and the striped. Hyenas were domesticated and raised for food in Ancient Egypt. 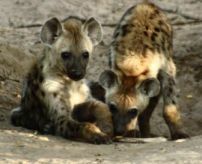 Female hyenas give birth to 2 to 4 cubs in a litter.